UPDATE: I have found the trailer for the game - just scroll down to the bottom of the page. HELSINKI & LOS ANGELES – January 31, 2011 – ANGRY BIRDS, Rovio’s blockbuster smart phone and tablet game that has become a global cultural sensation, and RIO, one of the year’s most anticipated motion picture events, are joining forces to create a new game, ANGRY BIRDS RIO – representing a first-of-its-kind game development partnership between Rovio and Twentieth Century Fox. 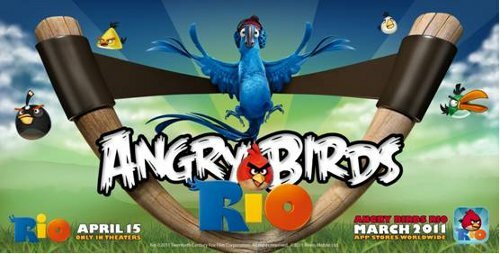 The announcement was made by Mikael Hed, CEO at Rovio Mobile, which created ANGRY BIRDS, and Peter Levinsohn, president of new media and digital distribution for Twentieth Century Fox, which releases RIO in UK theatres 8th April 2011 in 3D. "ANGRY BIRDS RIO is a match made in heaven for a mobile application and a major motion picture, and this collaboration with Fox is definitely one the most exciting partnerships we have entered into with the ANGRY BIRDS brand to date," said Mr. Hed. "In addition to expanding the horizons of two fantastic entertainment brands and creating a great new gaming experience, we have also taken the concept of combining a mobile application and motion picture promotion to an entirely new level." From the makers of the hit ICE AGE series, RIO is a comedy-adventure about taking a walk on the wild side. Blu is a domesticated Macaw who never learned to fly, living a comfortable life with his owner and best friend Linda in the small town of Moose Lake, Minnesota. Blu and Linda think he’s the last of his kind, but when they learn about another Macaw who lives in Rio de Janeiro, they head to the faraway and exotic land to find Jewel, Blu’s female counterpart. Not long after they arrive, Blu and Jewel are kidnapped by a group of bungling animal smugglers. With the help of street smart Jewel, and a group of wise-cracking and smooth-talking city birds, Blu escapes. Now, with his new friends by his side, Blu will have to find the courage to learn to fly, thwart the kidnappers who are hot on their trail, and return to Linda, the best friend a bird ever had. The original ANGRY BIRDS game puts you in charge of a quirky flock of birds, who go on an intense assault on the hungry green pigs who have stolen their eggs. In the game, you use a slingshot to send the Angry Birds smashing into the pigs and their puzzling constructions. The exciting physics-based gameplay combines the special powers of the Angry Birds with skill, logic and brute force. In 2010,ANGRY BIRDS was downloaded over 50 million times on various smart phone platforms, and it is also available for PC and Mac.